Gotten every class to at least level 30 and into their job over the past 5 days, save for GLA and MRD. I've been leveling GLA in the Duty Finder, where I'm come to feel dread whenever I see certain classes in the instance with me. THM/BLM and ARC/BRD? I'm not going to be able to hold aggro. ACN and SMN? They're going to summon Topaz Carbuncle on me and make it very hard for me to actually tank. SCH? They're going to be stupid and stand next to me the entire time I'm tanking...and their fairy is going to steal aggro from time to time. CNJ/WHM? They're going to DPS most of the time instead of heal, and when they do heal, they'll spam Medica instead of Cure when I'm the only one hurt (thus gaining massive aggro). This is just from what I've encountered in the 25 runs TODAY ALONE. Awwww, you should have leveled with me back when I was playing. I played cautiously and only DPSed when the tank was obviously able to survive a while without being cured. I rarely used Medica outside of emergencies, but in my entire playthrough including a week of nothing but postgame DFs I only had someone fuss at me for Medica spamming once. I saw it as the tank's fault, given it was Titan HM and I had been healing on it the same way for days without drawing aggro or winning. I don't mind the use of Medica if the whole party is damaged, like against the final boss of the Haukke Manor normal mode. It's when only one person is damaged...they could be casting Cure during that instead, as it does the same job for 1/4 of the aggro of Medica. I also don't mind the DPS...but when my HP is nearing half health, I want to see healing, because any lower and it won't be pretty. These bad healers actually waited until the last second to heal, usually with me at 50 HP or less. I've had a few runs where I gave out 0 commendations because nobody had earned it, because the healer was one of those last second healers, and the two DPS were pretty bad. I'm talking an Arcanist not using DoTs, and a Lancer not buffing his attack with Heavy Thrust or moving around to give bonuses to the various attacks, just standing in front of the monster with me attacking there. This crap is happening in Halatali with level 28+ players btw, they should know better than this. EDIT: Also, I've encountered a glitch that only happens once. I never knew Savage Blade existed for a GLA, which increases enmity gained. Simply because when I hit level 4 last week, there was no notification for it and it never appeared on the hotkeys. So I've actually been doing inefficient tanking until I was told today that it's a skill you gain at level 4. Currently on Leviathan as Chimarea Riverchaser. Ah, I'm sorry that I missed this post earlier. If you want an invite to the FC, I'll keep an eye out for you so I can send you an invite. However, given that you're in the UK, you might be better off finding Severin or Quin. I hope you enjoy the game, and welcome to the boards. Yeah... At some point on my Archer I was running around in what basically amounted to ***-less chaps... My wife glanced up and asked: exactly what sort of "role-playing" are we doing here? Yesterday I managed to get the final classes to their respective jobs, so now every class is level 30+. I really need to take a healer and a tank to level 50 and fully deck them out, just so I can say I've done so, and have some back-ups just in case I need them. My Dragoon is now more or less decked out in full Dl now so I should really get to work on HM primals for my relic, but.... I bought an Obelisk just to be different, and this thing is WAY cooler then the relic, it's got prongs that fold out and everything! I started working on Scholar (and subsequently Summoner, since they both share the same base class level). I'm actually having the most fun with these two out of all the other classes. It's fun throwing Bio II, Bio, and Miasma onto an enemy before using Bane to toss those same conditions to the other enemies nearby, as well as having Ifrit just beat the crap out of enemies. Scholar, if you ever decide to do it, just remember, the faerie isn't there to do all the work for you, consider it your helper to help do your job better. Keep Eos out if you're healing in 4 mans, her AoE mag def and AoE HP regen buffs are too good to not use. Selene is really only there for 8 man groups IMO, since she has a silence and a spell speed up. Plus keep it on Obey, because being able to throw those out at the needed time can save lives. My Excalibur FC got their house... currently the only one in the Butte! You STILL don't have your relic?! LIES! They are so awesome that they're now getting outclassed by the prize for completing all the extreme mode primal fights unless you're using the Zenith variation! Ahh Titan, the hardest primal PERIOD. Garuda is easy once you know how she works, and Ifrit is just as easy. Titan though...lag once and it's over. It's why I hate that fight, it's too much stuff you have to watch out for AT THE SAME TIME. Even experienced parties have problems with him due to all the stuff you have to avoid. Bomb phase? Grats, he's going to Landslide your location before you can move away from the explosion. Weight of the Land? Grats, he just aimed for everybody in just the right way to where one person will die guaranteed. Well, the RPGamer Leviathan FC finally hit rank 6 pretty recently, so we can probably start discussing whether we're going to invest in an FC house or not. So, its informal poll time. Anyone interested please answer the following questions. 1) Where would you prefer to have an FC house built? 2) How much Gil are you willing to contribute to this cause? We're going to need quite a bit of Gil to get it built, which may be a problem given how few of us seem to be regularly playing on Leviathan at the moment (come on, join us!). Personally, I'm fine with either building it in the Lavender Beds or in the part of the Goblet near the pond area. I think I can contribute around 500k Gil for this, and I think my brother can match that. Got my relic finally. Titan ended up being a bit of a let-down really, and though a big part of that was my group being good enough they could have won had I stood around doing nothing (love my FC), I actually found dodging everything to be really easy for the most part. I did die once to weight of the land because I got distracted at the absolute worst possible time, but other than that hiccup I didn't find it particularly hard... though I imagine trying to do it through DF is another matter entirely. I think the best part of our house is the jumping puzzle we set up with lawn ornaments that lets us get up to this otherwise inaccessible balcony. Anyway, I need to log back in as Kaye one of these days to see how you're all doing. I must have a bajillion rested experience points to earn by now. If we're planning to buy/build a FC house on Leviathan, I better start crafting again to save money. At the moment, I don't even have 100k to my name, but given some time, I could build up enough to contribute 100-150k, which I know is hardly a dent in the overall cost. In other news, I finally got relic+1 ony my bard yesterday. Now, it's time to finally beat Hauke Manor HM and Pharos Sirius, not to mention the moogle king and extreme primals... The list goes on. There will never be an end to this game while my backlog of console rpgs grows. I haven't been playing on Leviathan as much, as I'm trying to finish the game off on Excalibur, and I'm finding that I prefer healing to tanking. That said, every time I try to get on Leviathan, the FC seems empty. If there's a good time when many others are on, I could set that aside for playing around over there. I'm mostly on late night, 10pm or later MST until 1-2AM MST. Well, sadly, there are not that many of us around playing outside of a small group... I think it is usually busiest around the afternoon PST, with things going pretty quiet by the evening. My own playtimes are pretty random, going anywhere from noon to about 9 PM, though never that whole time all at once. :P I'm playing pretty much every day, though. Typically, I'm on from 4:30 to 10:00 PM EST every day with a few scattered breaks. 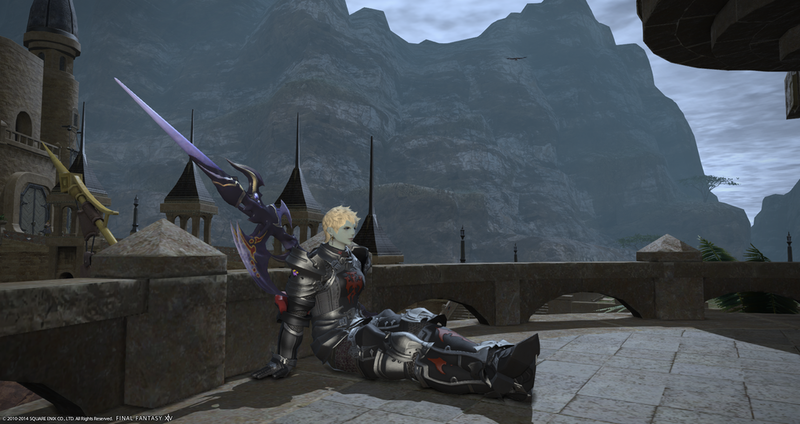 Even while I'm away, my character is staring off into space somewhere in the Leviathan game world. Interestingly, I notice in the Free Company members list that there are a number of players on at least once every couple of days; yet, I've never seen them. 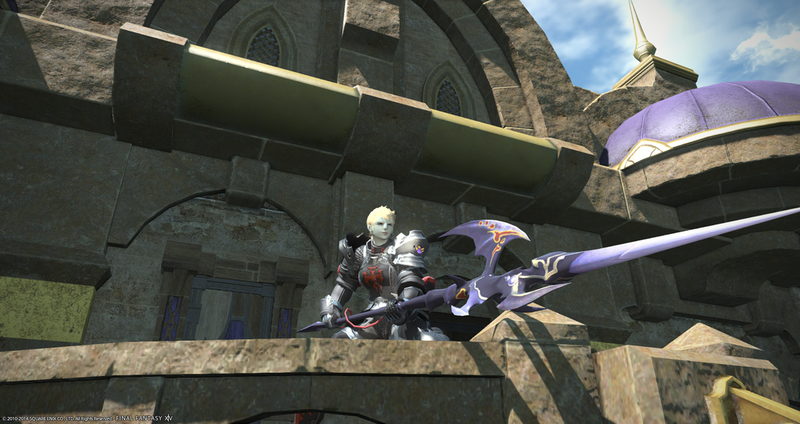 I've got my zenith, now for myth armour. It would probably help if I'd stop getting 90k's in dungeons... got one just before we beat the last boss of copperbell HM tonight, and couldn't log back in. No myth for me! On the days I'm on it's usually a few hours somewhere between 6pm-12am GMT (1-7pm EST), although I'm a bit sporadic. Not been on much this week due to a combination of illness and being busy and the fact I've currently got a review game means that'll take priority for the next one/two most likely. Ugh, I'm reminded how much I hate Aurum Vale (more like Aurum HELL). Things kill you faster here than in the level 50 dungeons, the 2nd boss has no AoE red line/circle signals at all, and if you're a SCH, your faerie dies way too fast, gimping your overall healing ability. In case the few RPGamers who still log on are unaware, I basically stopped playing because my internet began to constantly disconnect me a few months back, and I just dont have the energy to seek alternate places to play anymore. Especially since I completed everything there was to do besides own a house or whatever. I'm sure Twin and Lucas gathered that much by now, but for anyone else, thats the story. I'm typically on every day, faithfully. However, my area is under a state of emergency without power for the next several days so I won't be on until next week. Just to let you all know, my brother and I will be taking a break from the game for a while. Our current subscription is due to run out in the next few days, and we're taking that as a chance to walk away for a bit, play some other games, and not worry about gathering our weekly allotment of tomestones. To be honest, I was hoping to get a little bit further into the endgame than I have in this time, but what can I say? Titan Hard Mode is a giant pain in the neck. We'll almost certainly be back for patch 2.2, and maybe earlier if a seasonal event looks interesting enough.